Looking to lighten your load on your next backpacking adventure? An obvious place to start: your sleep system. Gotcha covered here if "sleep system" is a puzzling term. This Outdoor Vitals quilt review takes a close look at a synthetic down topquilt designed to go the distance, lighten your load, and stand up to water. This Outdoor Vitals quilt review gives the facts you need to determine if it's your Prince Charming backpacking quilt! Hiking For Her is always on the lookout for innovations in gear design to share with you, so when Outdoor Vitals popped up on the gear radar, it was time to take a hard look. 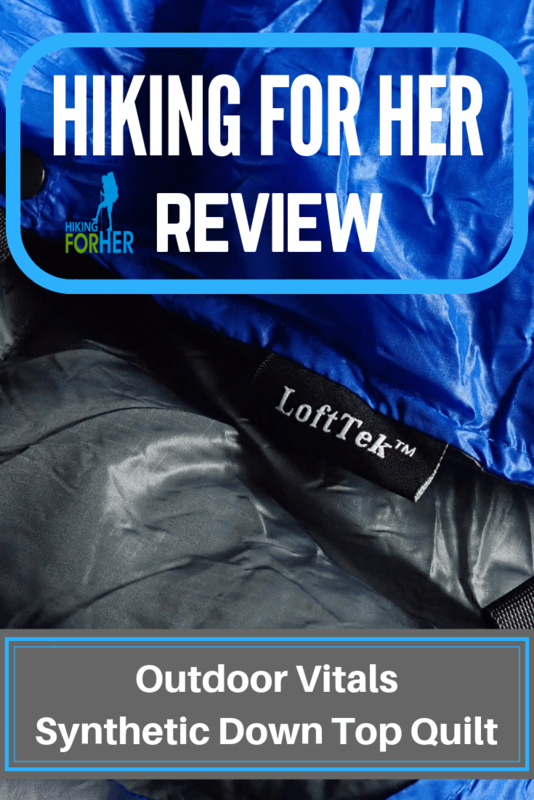 Outdoor Vitals provided a 15 Degree LoftTek Ultralight Backpacking TopQuilt free of charge for this review. Hiking For Her is an Outdoor Vitals affiliate. If you purchase Outdoor Vitals gear through the links on this website, HFH receives a small percentage of your purchase price. Without costing you anything extra. All of the comments, opinions and photos in this review belong to Hiking For Her, so you get the real scoop without any bias. Because that's how HFH rolls: trustworthy reviews to put the best hiking gear in front of you when it's time to make purchasing decisions! And to show you, step by step, how to size up a piece of outdoor gear. If you're not sure about the merits of backpacking quilts, read this first. The problem all backpackers face is moisture. how to stay warm when soaked. How lightweight and compressible the material is - or isn't. This relates to backpack volume and weight constraints as you prepare for, and complete, a hiking trip. What's different about this topquilt? a highly compressible synthetic down, new on the market, which stays warm when wet (unlike duck and goose down). If you're a hiker facing wet conditions, that should get your attention. You probably have some questions about what's inside that stuff sack. When it's snapped up around your body, it has streamlined contours which we'll go ahead and call a moderate mummy style, using sleeping bag terminology. That means the quilt tapers toward the bottom end, so the end is slightly more narrow than the wider top opening (where you crawl into it). Hugs your contours, in other words. I used a compression stuff sack from my gear locker to see how small I could get this quilt. Will it compress as well as, or better than, my down sleeping bag? Outdoor Vitals says the compressed size is 8 x 7 x 7 inches. If you're using a synthetic fill bag, this small footprint should blow your mind. Think about all of the room your current sleeping bag demands from your backpack. Then think about 8 x 7 x 7 inches. What could I do with all of that extra volume in my pack? I also stuffed my current down sleeping bag inside the same compression sack (after removing the quilt, just in case you're wondering). I was curious if I would be able to wring out any volume savings so I can lug more junk around optimize my packing using this quilt. I can't say there was much of a volume difference. Regardless, this quilt has a darn small, lightweight footprint in a backpack - very fine attributes indeed. Does a gung ho ultralighter need to stress over how small and compressed a piece of gear can become? As the load lightens, presumably so does the need to watch anxiously over every piece of gear disappearing into the voluminous (or not) backpack. So while this bag scrunches down into a lovely little ball, does it really need to be compressed before it enters your backpack? Some UL hikers loosely stuff their quilt or bag into the pack, preserving loft and using it to snugly secure the rest of the gear. On to another important question. The weight of the regular length in this review comes in at 2 pounds, 2 ounces per Outdoor Vitals specs. The long version weighs 4 ounces more. Disclosure: I did not verify this weight. Compared to my current sleeping bag, the quilt saves me nothing in weight. But as an older female hiker, that's not my main concern. Temperature rating, in other words. This bag is rated to 15 degrees Fahrenheit, which puts it into three season serviceability. If you're a winter camper, look elsewhere for a way to trap your body heat. You need more fill power. This 15F temperature rating uses the EN testing standard adopted by most outdoor gear manufacturers. Third party verification means the number as reported by Outdoor Vitals is trustworthy. It also allows you to compare this backpacking quilt with others. A caveat: There is a difference between comfort and lower limit ratings. It wasn't clear to me which one was being referred to by the 15F rating. Always look at any temperature rating number with a healthy dose of skepticism. There are no gender specific temperature ratings (although if I had my way in the industry, there would be). Disclosure: that's not strictly a true statement, in the sense that companies which rate outdoor gear use young males almost exclusively as test subjects. So temperature rating numbers are more reliable for males. Hey, no worries, my trail sister: just use your own scale! If the tag says 15F, mentally bump it up to 20F to ensure your comfort. Option two: Be crafty about the clean, dry clothing you choose to wear to bed, in order to maximize the temperature rating on the quilt. To get up to speed on fill, loft, baffles and more, read this first. No need to worry about zippers, because there aren't any on a quilt. Personal note: the zipper on my sleeping bag can be headache inducing when it jams. It's no secret that geese and ducks have solved not only the relentless downward drag of gravity, but how to stay warm in frigid temperatures. Their secret weapon for warmth is feathers, specifically the tiny barbed ones closest to their body, called down. For this quilt, we're looking at a human version of down called LoftTek. This fill material is a microfiber hollow filament synthetic with the attributes of natural down that we're seeking: highly compressable and able to trap body warmth. In addition, each fiber is coated with silicon to repel water molecules. Did you catch what just happened here? Regardless of which off trail sports you follow, it's a win for all of us trail lovers. Bonus: the silicon coating also allows the fibers to repel each other, avoiding clumping in baffles that will create cold spots in the quilt. An organization called the IDFL Institute and Laboratory rates textiles and provides quality assurance services. They rate the fill power of LoftTek at 525+. The scale important for hikers runs from a notch above 900 (exceptionally warm, high quality material) to 450 or so. When this quilt is put to the ultimate test, how does it perform? Luckily, I didn't have to do a torture test. Watch as Outdoor Vitals (YouTube video) answers that question here. It's difficult to force water through the outer layer of the quilt, so if it gets damp inside your backpack or tent, it's not going to quickly transfer the water to your skin. When thoroughly wet (on purpose, as in pouring bottles of water INTO the quilt - watch the video for yourself), the insulation may shift. Inspect the quilt baffles (stitching creates small boxes to hold insulation in chunks) for areas where shifting occurred, and do some rearranging before getting in. The quilt can dry from the inside out as you sleep, thanks to your body heat. Eat an extra energy bar and a big hunk of chocolate before you crawl into a wet quilt! Trust me in this Outdoor Vitals quilt review when I tell you that you really don't want to go down the rabbit hole of learning the nuances of various units used in textile measurement. Let's just unpack the terminology used to describe this quilt's fabric in a cursory fashion, enough to give either a thumbs up or thumbs down. If I slip into geek speak, please forgive me, then jump down to the bottom line below. D stands for denier, and is a measure of the linear mass density of a fiber. Ouch! Let's try that again. One strand of silk (thanks, Mother Nature) gives us the base unit for one denier, and if you extend that strand out to 9000 meters (pity the silkworm! ), it weighs one gram. So the term "denier" is a mashup of "density" and "linear" (which is why it sounds so weird when you try to pronounce it). It serves as a unit to compare one fabric's fibers with another in terms of thickness. Or, it refers to a medieval French coin. But not here in this Outdoor Vitals quilt review. Who cares about word origins when you're facing a cold, wet night? As hikers, we care about a fabric's durability, water repellency, and weight. Denier units provide you with a comparable measurement of thickness and durability, with higher numbers giving you more of these highly coveted characteristics for outdoor gear. And that means less weight compared with a 40D quilt. The shell fabric in this quilt is also water resistant, thanks to a coating called VitalDry applied by Outdoor Vitals. I can't comment on durability yet, but I'll report back after I've used my quilt through a complete cycle of three season camping. For the record, I can't imagine a scenario in regular hiking conditions where you'll sleep in this quilt on an unprotected, rough, scratchy surface like a granite rock face or jagged wood splinters. 20D won't hold up long under those conditions. But for normal use with a sleeping pad or a tarp beneath you, it's plenty durable. 20D seems pretty standard for non-outer wear outdoor gear, or ultralight gear - even when it's a jacket designed to protect you during changeable weather conditions in non-abrasive terrain. So now you know that it takes a bit of forethought to treat 20D right on the trail. No rolling around on granite boulders while huddled in your quilt! You want the insulation you paid for to stay inside the quilt. And you want the stress points (shoulders, for instance) to bear the forces you exert as you toss and turn rest easy after a long day on the trail. Speaking only for myself, sometimes I'm too keyed up to drift easily off to sleep, and it takes several full rotations inside my sleeping bag or quilt to get settled. See the black fabric pull tabs on both parts of each snap? The snaps which close up the head end of this quilt are reinforced, to withstand the impatient tugging you might apply when you're in a hurry to get outside at midnight. The stitching seems (did you catch that?) up to the task as well. Because this is a topquilt and I'm a ground sleeper, it was paired with a sleeping pad. The Big Agnes insulated Q-Core SLX, to be exact. By the choice of an insulated sleeping pad, you can see that I'm an ice cold sleeper. My feet never seems to warm up, and let's not even talk about my neck. So to say I was skeptical when I crawled into this lightweight quilt doesn't begin to cover it. The absolutely first thing I noticed: the roomy footbox, despite the tapered design. Note: The toebox does not open up all the way, so you can't use this quilt in a traditional blanket conformation. But the advantage of having a "permanent" toebox is that it warms up fast because there are no snaps or open areas where body heat will leak out. And it makes a great spot to stash your clothing for the next day, so you can avoid pulling on ice cold layers first thing in the morning. 1. The softness of the 20D nylon felt welcoming and comfortable for a stiff, sore body at the end of the day. 2. It was a snap (or two) to get sealed into the quilt. 3. The quilt interior warmed up rapidly, much more so when compared to my current sleeping bag. Reduced wait time for warmth, it's a beautiful thing. Personal question, but okay, I'm a side sleeper. As a side sleeper, I was able to burrow into the closed up quilt and keep drafts off my neck (at least at first). If you're not a burrower (i.e. can't stand covers over your head or face), keep reading. I was able to get into a deep sleep and stay there for several consecutive hours, as is my normal pattern when I'm both keyed up and exhausted from trail time. This is a testimony to the warmth and comfort I enjoyed tucked into this quilt. I cheated: I wore a long sleeve thermal top and long johns, to counteract the lack of insulation beneath me. It's a topquilt, right? Gotta keep that backside warm. It's not cheating to optimize the design of a piece of gear by adding your own unique twist to it. That's called being a smart, safe hiker. I just mentioned how you can keep your backside toasty. While a quilt takes some of its design cues from a sleeping bag, it drops the snuggly hood - on purpose - to save weight. For me, this is the strongest drawback to switching from a sleeping bag to a quilt: there is no way to trap heat around the vulnerable head and neck areas. My neck and head felt cold once I settled in, even though the ambient temperature inside the tent was probably around 50F AND I'm a self-confessed side-sleeping burrower. Because I am unable to train myself not to un-burrow when I am fast sleep. By the second day into a hiking trip, my hair is feeling so gross that I wear a hat 24/7. In the interest of hygiene, I have a designated "sweaty" hat for hiking, and a "clean" hat less sweaty cap for sleeping. I find that a close fitting wool cap with a fleece lining is best for sleeping. And a fleece scarf around my neck. Both were dug out of my backpack and pressed into service before I got into the quilt. To avoid bringing along several hats and scarves (even though you now have all that extra room in your pack), buy an adjustable balaclava to cover your head and neck all in one fell swoop. Fleece works great for spring and fall camping, and can be adjusted for a close or loose fit. A polyester microfiber Buff is a nice lightweight option if fleece heats you up too much. A down balaclava or hood is a good investment piece in your hiking layering system, because it can be pressed into service on a wintery trail. I'm wondering if the siliconized microfibers will stay coated with that water repellent finish after multiple machine washings. I'll report back if the water repellency or lack of clumping seems to suffer after several wash cycles. And to extend its life, I won't be sending this quilt through the dryer. Instead, I'll line dry it and store it unpacked so the loft won't be affected. Because it's synthetic down, my abundance of caution might not be necessary, but I try to keep my gear as long as possible. Baffles are sewn into the nylon fabric to hold the insulation in separate compartments. It's part of that whole "quilted" appearance. Each baffle on this quilt measures ~10 inch x 7 inch (as verified by my trusty blue ruler featured above). When you crawl inside the quilt and hold the top layer up to the light (moonlight, headlamp, what have you to pass the time before you conk out), you'll notice that the down insulation does not fill the entire baffle. This did not seem to be a problem with trapping my body heat, however. It felt like there was plenty of insulation and it was quite well distributed in my dry quilt. You'll have to watch out for clumps of the synthetic down, and redistribute it within each baffle as best you can. Clumps are never your friend, whether in a wet quilt or a re-hydrated backpacking meal. It's good to know who you're doing business with, especially if you want to develop a long term relationship. All merchandise is sold through them, to save costs and give you an affordable price. While this may create inconvenience, it also creates 40% or more savings, which puts gear into more hands (it removes a cost barrier). Outdoor Vitals designs gear to be used for a variety of purposes, thus keeping your gear shopping list, or "must replace" list, shorter. And thus, saving you money. 1% of their revenues are donated to help others. As the original owner in the U.S. or Canada who does not abuse gear, you have a lifetime warranty against defects (another reason to avoid sleeping on granite boulders). For more specifics on their quality gear, visit the Outdoor Vitals website. If you scrolled down here just to get the recap, here it is! Warm. When. Wet. Need I say more? For those of us who want to go light but still want a roof over our heads, this quilt offers versatility. As a topquilt, it can be paired with a sleeping pad inside a tent or beneath a tarp. You can also use it for hammock camping, with the aforementioned hacks for head, neck, and backside. Just between you and me, I'd consider using an underquilt too, which Outdoor Vitals also offers. Using this quilt, you can thrash around and stick out your arms and legs to your heart's content - no "confined to quarters" feeling as in a sleeping bag. And regardless of where and how you curl up in this quilt, you will remain warm for three season camping - even if the quilt gets wet. And those of us who commute or travel in dicey winter conditions, why not stash it in the car or gym bag when you don't need it for the trail, "just in case"? You can look high and low without finding another comparable down backpacking quilt at this price point that delivers the trifecta mentioned above. If you're just getting started as a long trail hiker, or want to lighten your load as a veteran hiker, this quilt gives a lot of quality without costing a lot. In case you missed what impressed me the most while doing this Outdoor Vitals quilt review, you get warmth when this ultralight backpacking quilt gets completely wet. That's priceless in terms of getting you back to the trailhead during the rainy season(s), because hypothermia is no joke. Or if you have to sleep in melting snow during spring or fall conditions. Testing this quilt forced me to think hard about switching from my beloved down sleeping bag. Stay tuned for an Outdoor Vitals quilt review update as it is used over one full year of hiking adventures. 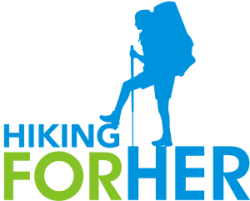 Hiking For Her is expecting more good technology and thoughtful designs from Outdoor Vitals in the years ahead. This backpacking quilt will lighten your load without excessive lightening of your wallet. If you have questions about anything you've read in this Outdoor Vitals quilt review, drop me a line. Still debating between carrying a sleeping bag or a backpacking quilt?